Owners know how hard it can be to leave your pet at home alone. Many pets struggle with increased anxiety, loneliness, and sadness when their owner leaves. For owners, there may be fear that a pet will have an accident or destroy their property. Unfortunately, between work, school, and errands, many people are forced to leave their pets at home due to daily obligations. This is our Webmaster's dog "Bear". He accidentally ate that headset because he got lonely. Many pet owners wish they could check in on their pets to make sure they are not damaging the house or exhibiting anxious behavior. Oftentimes, for many pets, just hearing the owner's voice or seeing them is enough to combat anxiety or loneliness. This is the thinking behind PetChatz, the video conferencing market's newest product. 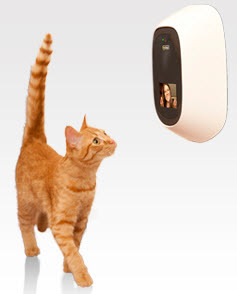 Retailing for $349, PetChatz is a small, durable video conferencing unit designed to connect dogs and cats with their owners while they are away. The product is installed in the owner's home, or preferred location, and mounted at the pet's eye level. Once installed and connected via Wi-Fi, owners are able to login at any time and video conference with their pets from a work computer, laptop, or even via app for mobile device. 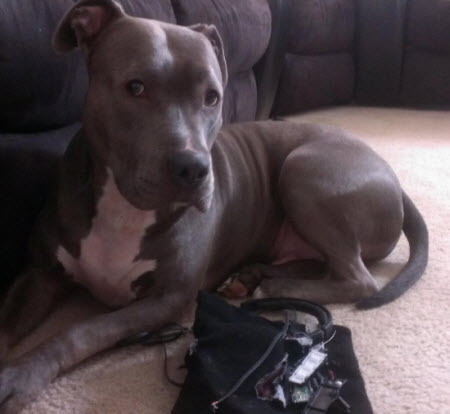 A special ringtone sounds on the device to alert pets that their owner is calling. Once connected, the owner can view the pet's activities, speak to them, or even record a video. 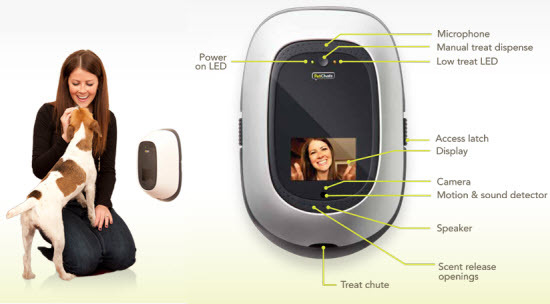 Additionally, there are some interactive features built into the PetChatz device to enhance the experience. Owners can choose to remotely dispense a treat from the device or add a PetChatz Scentz� pad which emits a soothing scent and can be customized. PetChatz was recently honored at the SuperZoo pet retailer show as one of the top new pet products. Approximately 60% of households in the United States currently have at least one pet, making for a very solid marketplace for PetChatz. Although not available for purchase yet, the company's website is taking online preorders and expects PetChatz to be available nationally in specialty pet store and other retailers in early 2014. Christina Gray is the Marketing and Business Development Manager at Telepresence Options and an occasional reporter and columnist. When she is not covering innovative visual collaboration applications, Christina helps organizations understand the unique and multi-facted Telepresence Options program and optimize and maximize it to reach their marketing goals. Click here to email Christina. This is our Webmaster's dog \"Bear\". He accidentally ate that headset because he got lonely. This is the thinking behind PetChatz, the video conferencing market's newest product. Retailing for \$349, PetChatz is a small, durable video conferencing unit designed to connect dogs and cats with their owners while they are away.